The Grand Superintendent Tony Harrison received a very hearty and earnest welcome when he attended as the guest of honour at the installation convocation of Vale Chapter of Installed Principals No 5256. Pictured from left to right, are: André Lawrence, John Stanley and Bill Glassey. The occasion was further enhanced by the presence of the Deputy Grand Superintendent Paul Renton, Assistant to the Provincial Grand Principals Chris Butterfield, Past Second Provincial Grand Principal Chris Band and Past Assistant to the Provincial Grand Principals David Grainger, together with a plethora of other grand officers. As Vale Chapter spans two groups, the Chairman of Lancaster and District Group Neil McGill together with the Chairman of Furness and South Lakeland Group Peter Schofield were also present. 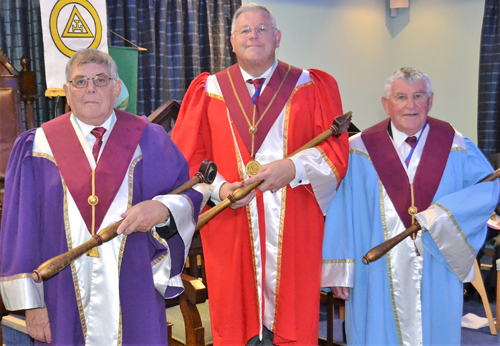 Acting Provincial grand officers in attendance were David Barr, Peter Quirk, Christopher Reeman, Paul Thompson, Dennis Laird and Steve McClintock. Also present was Dave Thomas Provincial Deputy Grand Director of Ceremonies, who choreographed events both in the temple and at the festive board splendidly. 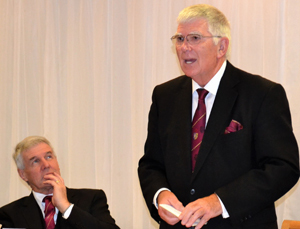 Nigel Higginson, the retiring and installing first principal opened the chapter and neatly dispensed with the early business, including the ballot for four joining members. Following the announcement of Tony Harrison’s demand for admission by Dave Thomas, the distinguished group of grand and acting Provincial grand officers made their entrance into the chapter. After the formal welcome, Nigel offered Tony the sceptre of the chapter, which he gratefully received but promptly returned together with the wry observation that he was there to enjoy the evening and that end would best be served by him allowing Nigel to continue with the ceremony. The three principals were then, as is traditional in this chapter, obligated and installed with a minimum of ceremony but a maximum of gravitas and sincerity. John Stanley took the red robe of first principal, André Lawrence the purple robe of second principal and Bill Glassey was duly invested with the blue robe of third principal. The officers of the chapter were then appointed and invested with, as is again traditional in this chapter that spans two Masonic groups, the roles being equally divided between companions from both sides of Morecambe Bay. On the completion of the appointments, Tony rose to comment that he was delighted to be present at the installation convocation and that he had witnessed a most enjoyable and sincere ceremony. Tony also offered his congratulations to all three new principals and hoped they had an enjoyable year in office. First principal John Stanley replied that it was an honour and a personal delight to share his company and then handed Tony a cheque for the sum of £300 to the MCF 2021 Festival. The presentation of the cheque meant that Vale Chapter had now become a Vice Patron of the MCF 2021 Festival and Tony was delighted to present John with a certificate acknowledging the chapter’s status, an achievement to be really proud of. Following the first rising, the grand and acting Provincial grand officers retired in processional form. The remaining business of the day was duly completed before the chapter was closed and the members and guests adjourned downstairs to the Wyrebank Masonic Hall Banqueting Suite. Tony Harrison (right), with Paul Renton in attendance, responding to the toast to his health. Tony responded by expressing his delight at being able to attended the meeting and witnessing how the members of both groups got on so wonderfully together. Tony began the body of his address by exploring the importance of the Royal Arch to Freemasonry and that it was his wish to increase the profile of the Royal Arch within the Province. Just over 43% of Craft members in the Province are currently in the Royal Arch, but there is still much more work to be done in encouraging new members to this beautiful order. Tony moved on to thank all present who had made pledges to the MCF 2021 Festival. It had now been running for 18 months and hoped any companions who had not made the pledge would do so in the near future. Tony concluded by expressing his wish that all companions enjoy their Masonry and in particular Royal Arch Masonry. There then followed a toast to the Provincial officers from the Provincial Grand Scribe Nehemiah David Barr, who congratulated the entire team on taking part in a ceremony which had been conducted in such an exemplary manner. Nigel Higginson gave a delightful personal toast to the three Principals, which John Stanley had the honour of replying to. John said he was stunned at the number of companions who were present at the installation and festive board and that the whole evening had been a great start to the new Masonic season. The evening was concluded with the announcement that £279 had been raised from the collection plate which had been passed round the chapter room during the ceremony. Presentation of the Vice Patron of the MCF 2021 Festival certificate. Pictured from left to right, are: Geoff Bury (regional charity steward), André Lawrence, Tony Harrison, John Stanley, Bill Glassey, Paul Renton and Neil McGill.